New Jersey’s Mission of Honor for Cremains of American Veterans Mission is to locate, identify and inter orphaned and abandoned cremains, accomplishing it through the joint efforts of various veterans’ organizations, in order to provide honor and respect to those who have served this Country in time of peace and conflict. New Jersey’s Mission of Honor is a long term project, following local, state and national laws, in cooperation with funeral directors, Veterans Administration, and the New Jersey Department of Military and Veterans Affairs with interments at Brigadier General William C Doyle Veterans Memorial Cemetery. Through the efforts of the NJ Mission of Honor over 330 veteran's cremains have been reunited with their families and 288 Forgotten veterans have been honored and interred - a total of 618 veterans finally resting in peace. dissertation writing pricesto view list. With your donation, we would be able to purchase an urn to honorably inter these war veterans. The corresponding military branch of the service will be laser engraved on each urn for each veteran cremain that the Mission inters. Click here for more information. Check out the listing of our County Representatives throughout New Jersey. Click here to find your local contact. A solemn tribute to members we have lost. Complete with Amazing Grace. Click here to view. We couldn't do what we do without the help of our Supporters ! Click here to view our Supporters. 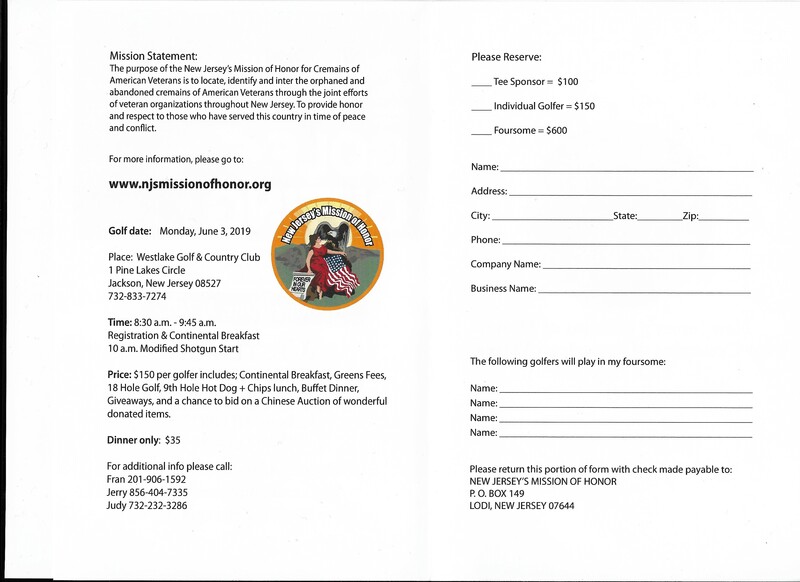 For information on our upcoming events or to see the NJ Mission of Honor in the news, Click here . Throughout the years we have captured some great photo memories of the Interments we have done. Have a look through them by clicking here ! We have numerous videos for your viewing - including Informational, Interment Services, motorcycle escorts and more. To view them, click here.